CustomVue has made significant improvements in the outcomes of people undergoing LASIK. CustomVue measures your eye with greater precision and in greater detail than previously possible. It takes a "fingerprint" of why your vision is blurry. Then when your eye is corrected, the laser uses this "fingerprint" to maximize your vision - Your "Personal Best Vision." When we do Epi-LASIK we uses this same enhanced CustomVue measuring technique. But you have the added advantage of having LASIK without any cutting. In other words, you have acheived your personal best vision by the ultimate safe method. 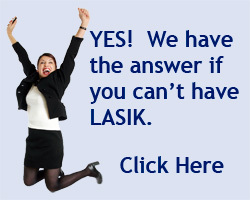 So if you have been waiting to have LASIK because your are nervous about having your eyes corrected, your wait is over. CustomVue Epi-LASIK is here! CustomVue uses WaveScan® technology, originally developed for use in high-powered telescopes, to measure the unique imperfections in your vision; imperfections that couldn’t be measured before. In fact, WaveScan measurements are 25 times more precise than standard measurements used for glasses and contact lenses. WaveScan produces a sophisticated map of your vision. Like your fingerprint, it’s one of a kind. 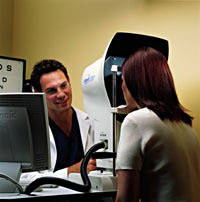 Once your eyes are measured and mapped, your treatment information is transferred to the laser. The CustomVue procedure tailors a distinct correction for each individual. In fact, each treatment is “designed” by the unique characteristics of the individual’s eye.